When Casandra Xavier crossed my radar on January 3, I wanted to learn more about her. I saw her in a Blind New World article and needed to share her Woman on the Move story. A quick Google search took me to her amazing address to the Massachusetts legislature video. To see advocacy in action, check out Casandra’s video at the end of the post. You won’t regret it! My name is Casandra and I go by the ghostwriter name, “CaspHer.” I am originally from Miami, FL but I grew up in Boston, Massachusetts. I identify as deaf-blind and was born with blindness and deafness. The conditions I have are both separate and just happen to be with me simultaneously from birth. Those conditions are Anophthalmos and Microtia Atresia. During my academic career, I did not attend Perkins School for the Blind even though I lived one town over. I also live near the Carroll Center for the Blind and was never introduced to either establishment until I was twenty-four. Currently, at twenty-eight years old I lived twenty-three years of my life trying to pass as sighted and hearing. I hadn’t begun to learn American Sign Language (ASL) until I was almost twenty-six. Since then I’ve developed enough skill to establish a comfortable working experience with an ASL interpreter. I studied visual arts and English literature in college. My plan was to remain in the art world since art was all I knew from a very early age. Looking beyond my world of writing fiction stories, digital photography, and tactile art was no-go. That is until I attended the Carroll Center for the Blind in Newton, Massachusetts. While attending the Carroll Center, I realized I could potentially become a great instructor for the blind or deaf-blind. I learned Braille with ease and quickly absorbed my other blindness courses. I wanted to learn more blindness related practices. After training at the Carroll Center, I attended Blind Inc. in Minnesota to fine-tune my blindness skills. This helped to reassure me that I would be okay. On completing my Blind Inc. training I learned I was not your typical blind person. I was indeed a proud deaf-blind woman straight out of the depths of Massachusetts! During training in Minnesota, I lost more hearing! Most people would have fled the scene but I’m not most people. I’m Casandra. I dug my heels in further and rode it out until the wheels fell off with extreme but minor modifications to my training. Satisfied with what I accomplished in Minnesota and teaching at a center for the blind; I flew back to Massachusetts and dove hands-first into ASL class at Perkins (2015-16). During my first ASL class, I excelled and was ready for the next level. I outdid myself at all other levels as well! I used a pro-tactile ASL interpreter to access information in an extremely visual class. Deaf-blind students use pro-tactile ASL interpreters to gather classroom information. The pro-tactile ASL interpreters use a technique to sign into the students’ hands. As I submerged myself into the deaf and hard of hearing (HOH) community, I was presented an opportunity to become an assistive technology trainer. For the longest time, I was totally stunned that something so great would happen to me. I worked diligently with my students and ensured everyone learned something. While doing all of these awesome things, I was still working on my signing skills which were coming along very well. I felt it was totally fine to feel proud of myself since I worked and struggled so hard to get where I was at the time. 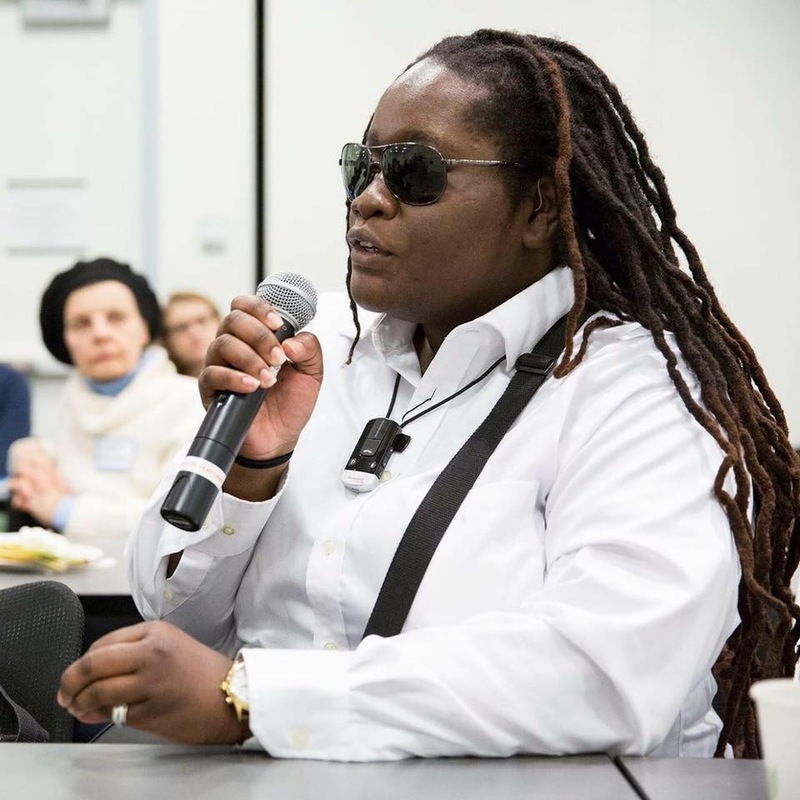 Though I missed out on learning deaf-blind skills when I was young, I have become an advocate for the disabled and the LGBTQ community. In the past year, I filed some legislation on disability awareness training starting in Massachusetts with intentions of it becoming federal law. While there are many pieces of similar legislation, mine will stand out because people within the disability community can observe and offer constructive commentary. This will ensure a positive experience for everyone. I enjoyed the wonderful opportunity working with the Massachusetts State House while bringing this legislation to life. During this encounter last summer, I got to see the inner working of the House of Representatives. At college, I learned a technique called, “application of knowledge” and I’ve carried it with me until today. I have decided that I would take all of what I’ve learned from the Massachusetts State House and apply it to my work as an advocate in the community. Not only did I use this method while advocating, I’ve also used it as an assistive technology trainer for the blind and deaf-blind as well. Letting my voice be heard after many years of being left in the dark and forgotten was the best and most encouraging experience ever. The power of exposing my strength was far too good to let go of, so I held onto that exposure and gave myself the title, “Disability Advocate.” I feel I have earned this title and it’s exactly how I want to be recognized. In the past few months, I have been invited to speak at schools in Boston and online podcasts to talk about my story and what I am doing. For a majority of my presentations around the city, I will use an interpreter. These days, I am still an assistive technology trainer in Massachusetts and still learning additional ASL skills. I am very involved with advocating for and with the constituents of Boston. Whether I am presenting or not, I always enjoy wearing a fedora hat with or without a necktie from Men’s Wearhouse and crisp white button down. A lot of my friends tell me I look like I am about to perform a music video whenever I dress up. Speaking of music, I enjoy shredding on the electric guitar and occasional karaoke sessions. I’ll be honest, outside of the extreme seriousness, I enjoy going out to gay clubs and having a blast with the drag queens and some friends in downtown Minneapolis. I hope you enjoyed this trip down story lane. Casandra sits at a table with a microphone at Perkins School for the Blind, was in the middle of asking a question. She wears polarized aviators. In the background are two people glancing attentively at her while she asks her question. Casandra’s dreadlocks drape down her back with a heavy, natural brownish-red color. Around her neck is a phone loop for her hearing aids, she wears a crisp white button-down shirt with her braille display strap exposed. She was fully aware of Perkins photographer. Casandra is an inspiration to us all. Made me reflect once more upon what I sometimes selfishly take for granted. Thanks for sharing her story Steph. Thank you for reading her story and commenting Bruce. I’m so happy that she finally got the help she needed and I think she is going to do great things in her future. I’m glad to find this awesome article from bold Blind beauty.